June 2014 marks 20 years since the bodies of Nicole Brown Simpson, ex-wife of NFL Hall of Famer OJ Simpson, and her friend Ronald Goldman were found outside Brown Simpson's West LA condominium. OJ Simpson was arrested days after the stabbing deaths at the end of a pursuit that gripped millions of television viewers. Months later, Simpson went on trial for the murders of his ex-wife and Goldman. Below, some of the key events in the OJ Simpson murder trial and ensuing civil cases. June 13: OJ Simpson's ex-wife, Nicole Brown Simpson, and friend Ronald Goldman are found slashed to death outside her Brentwood condominium shortly after midnight. Upon returning to Los Angeles from a trip to Chicago, the ex-football star is taken in for questioning. June 16: Funerals are held for Nicole Brown Simpson and Goldman. 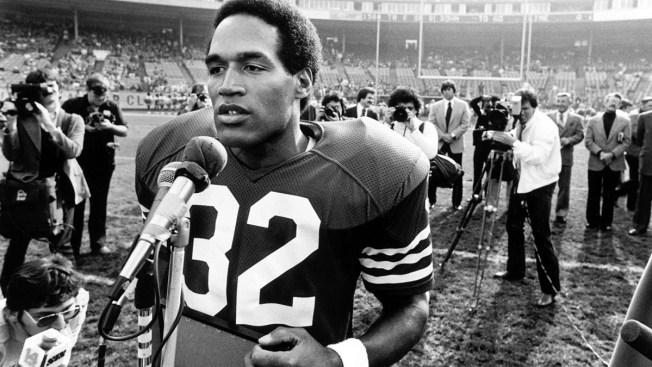 June 17: After failing to surrender and then leading police on an infamous low-speed freeway chase in a white Ford Bronco, OJ Simpson is arrested and charged with two counts murder. July 8: At the conclusion of a six-day preliminary hearing, a judge orders Simpson to stand trial. July 20: Simpson offers a $500,000 reward for information leading to the "real killer or killers." July 22: Simpson pleads “absolutely, 100 percent not guilty.” The case is assigned to Superior Court Judge Lance Ito. July 27: Goldman’s family files a wrongful death suit against Simpson, alleging he "willfully, wantonly and maliciously" killed him. Aug. 22: Some DNA test results suggest that Simpson's blood was found at the murder scene. Sept. 9: Prosecutors announce that they will not seek the death penalty against Simpson. Instead they will ask that he be sentenced to life in prison without parole, if convicted. Sept. 26: Jury selection begins in the criminal case. Nov. 3: The jury, a predominantly black group of eight women and four men, are sworn in. Jan. 4: The defense team drops plans to challenge DNA evidence. Jan. 11: Prosecutors release documents that detail dozens of allegations of physical, verbal and economic abuse. The jury is sequestered. Jan. 18: Ito rules alleged evidence of domestic violence is admissible. Jan. 24: Opening statements begin, with international news outlets and 24-hour video coverage being broadcast into the homes of millions. Jan. 27: Simpson’s book, "I Want to Tell You," written in response to letters sent to him in jail, goes on sale. Jan. 30: Attorney Johnnie Cochran Jr. completes the defense’s opening statements. Jan. 31: Sharyn Gilbert, the first of nearly a dozen domestic violence witnesses, is called. The 911 operator said she answered a call from Simpson's home in 1989 in which she heard a woman scream. Feb. 3: Denise Brown testifies that Simpson abused and humiliated her sister. The defense calls the testimony unfair. Feb. 12: Jurors tour Simpson's estate, the crime scene, Goldman's apartment building and other key locations. Feb. 14: LAPD Officer Robert Riske, the first to arrive at the murder scene, describes the bodies and says some evidence may not have been photographed. Under cross-examination, Cochran resumes his effort to show that police mishandled the investigation from the start. March 13: The defense argues that former Detective Mark Fuhrman is a racist who may have planted a leather glove to implicate Simpson. On the stand, Fuhrman denies the allegations. March 21: Simpson houseguest Brian “Kato” Kaelin says he can't account for Simpson's whereabouts during the time of the crime. May 8: Cellmark Diagnostics lab director Robin Cotton testifies that DNA tests show there are only a few people on Earth with the same genetic makeup of blood found at the murder scene, and one of them is O.J. Simpson. June 12: On the anniversary of the killing, Nicole Brown Simpson's family files a wrongful-death lawsuit. June 15: At the request of the prosecution, Simpson, wearing rubber gloves, tries on the leather gloves linked to the murders in what some experts view as the trial's key moment. He says, "They don’t fit." July 6: The prosecution rests. July 10: The defense begins their case, looking to raise questions about every piece of evidence offered by the prosecution. July 25: Several defense expert witnesses begin testifying. They cast doubt on DNA evidence by describing contamination in the LAPD lab. The defense suggests the possibility that police planted evidence. Aug. 29: Excerpts from Fuhrman's comments in taped interviews with a screenwriter are played. Defense says tapes reveal Fuhrman is racist. Sept. 6: Fuhrman is called back to the witness stand but refused to answer questions about whether he planted evidence against Simpson or falsified police reports, invoking his Fifth Amendment right against self-incrimination. Sept. 27: Reminding the jury that the gloves did not fit Simpson, Cochran says, "If it doesn't fit, you must acquit." Oct. 2: The jury reaches a verdict after four hours of deliberation. It is sealed. Sept. 18: Jury selection for civil trial begins. Oct. 23: Opening statements begin. Nov. 19: Secretly taped conversations of Simpson and ex-wife played for jurors. Simpson described as "animalistic." Nov. 22: Simpson testifies before a jury for first time. Denies killing Brown Simpson and Goldman but can't explain physical evidence against him. Dec. 4: Volunteer at battered women's shelter describes call from "Nicole" five days before Brown Simpson's slaying. Dec. 20: Orange County judge awards Simpson custody of children Sydney and Justin. Jan. 16: Both sides rest after 101 witnesses and 41 days of testimony. Feb. 4: The jury reaches its verdict: Simpson is liable in the two deaths.